Beautiful Blue Grullo Stallion. No white and loaded with all nine dun factor markings. Zeb is a 4th generation grullo. Triple registered-AQHA,IBHA, 94%NFQHA. Listed with APHA. With limited showing. Zeb is a 2X IPHA Halter Grand Champion and 3X IBHA Dun Factor Class Champion, placing 1st of 12 first time out. Zeb has earned points in IBHA Halter, Amateur Halter, Dun Factor. 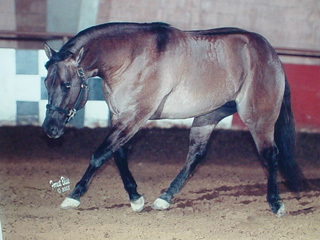 He was the 2003 NCDBA and 2003 CCPHA 2 yr. old Halter Stallion Champion. First colt born is a 2Xfuturity winner. Homozygous for the black gene. NO red foals. Want a color. Please see color pedigree. Zeb's sire has produced 100% duns and grullos. Zeb's grandsire is also a 100% dun factor producer (producing only duns, red duns, grullos, perlinos, and dunalinos). Both sire and grandsire are Homozygous for the Dun gene. Typical bulldog foundation style build. 2007 fee $600. Includes booking and first collection.